We know time is of the essence when it comes to getting your sales agents, customer service reps, and other employees licensed to sell and discuss insurance. And, we know you want a reputable education provider with the expertise and thorough course material to properly prepare your employees for their exams. You’ve come to the right place. America’s Professor has decades of experience developing high-quality, comprehensive pre-licensing insurance courses. We’ve helped thousands of students across the country pass their insurance licensing exams on the first try. We stick with our students until they pass their exam at no extra cost to you, or them. We offer discounted rates for companies and employers who give us their repeat business (call 1-800-870-3130 option 1 for information). Employers of every size—including household names like State Farm, Farmers Insurance Group, Allstate, Aflac, Shelter, and American Family Insurance (just to name a few)—put their trust in America’s Professor. Call 1-800-870-3130 to sign up today! Why Choose America’s Professor for Your Employees/Students? High Pass Rates: In states that report back to us, we typically see first-time pass rates in the 75%-85% range for combination courses (Property & Casualty or Life & Health). Time and test fees add up—give your new recruits the best chance of passing their exam the first time with America’s Professor! Expertise: America’s Professor has decades of experience helping students prepare for and pass their insurance licensing exams. Our comprehensive pre-licensing courses are designed to keep students engaged and help them retain the information they learn. Our goal is to do everything possible to ensure they pass their exam the first time. Discounted Rates: America’s Professor offers corporate discounts for companies that enroll students in our courses or refer students to our site; discounts are determined based on annual enrollment numbers. Contact us today to get access! Purchasing Options: Purchase one or multiple courses at a time; many employers purchase multiple quantities of a course to have books on hand. Teaching Videos: Comprehensive online insurance courses are available 24/7 on any device. 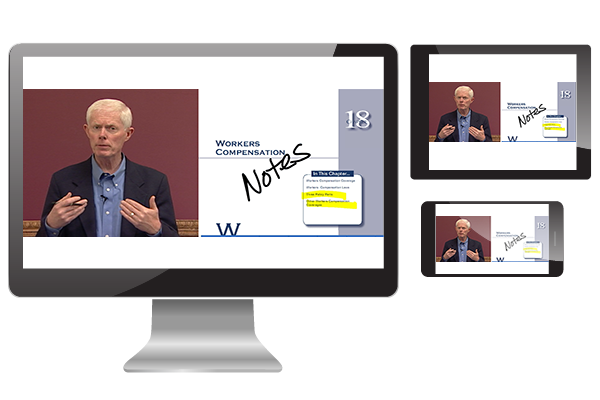 Our streaming videos simulate live lectures but let students set their own pace. Hard Copy Textbook: Included with each course, our textbook works in conjunction with the lecture videos. PDF versions are also included for students who want to get started right away. 45-Day Online Access: With additional time at no extra charge, as needed until students pass their exam. Students have instant access to their course within minutes of ordering. Sample Questions and Practice Exams: An ample database of sample questions and practice exams help reinforce the knowledge students gain from the video lectures and textbook. Customer Support: Our first-rate customer support team is here to answer all questions and make sure students have everything they need. Please do not use the same account for multiple users. Email addresses are like social security numbers in our system, everyone has their own and it should not be used by someone else. So, please do NOT sign employees up using “staff@…” as it is likely that someone else in the future will also use this same email address and it will duplicate progress records. Need to purchase multiples of the same course for multiple employees? If so, please fill out the shipping & billing information using your information. An email with further instructions will follow. A sales receipt will be sent to the student’s email address and included with the shipped materials. You can always contact AP for a copy of the sales receipt. Course prices are for one user. We stick with student until they pass their exam. For a single course purchase use the student’s name and email address. For a multiple course purchase (more than one of the same course) use employer’s name and email address. Employer will be sent fulfillment email requesting students’ names and personal email addresses. Invoice ordering is available; please call us with student’s information. Student progress reporting is available; please contact us to determine your needs. If you’re more comfortable ordering over the phone or you have a large order, call our friendly customer service reps to set up your corporate course. You may also email devon@americasprofessor.com. Got any Questions? We will contact you! If you would like one of out customer service reps to contact you, please fill our the form below. We we get back to you as soon as possible! This is your one-stop shop if you are wanting to pass your test the first time! Jack is very thorough about key topics throughout the course and makes learning enjoyable. His examples and correlations help beyond compare. Their staff is top-notch and everyone involved is there to ensure you pass your exam. I would not go through anyone else but America’s Professor – hands down! I’ve used America’s Professor for several of my new Team Members and it is absolutely the best study material I have ever purchased. Previously, my new TM’s would struggle to pass the licensing exams and now they are passing with scores in the 90’s. I would recommend this material to anyone that wants to pass the test on the first try. They are also great to deal with in getting started.